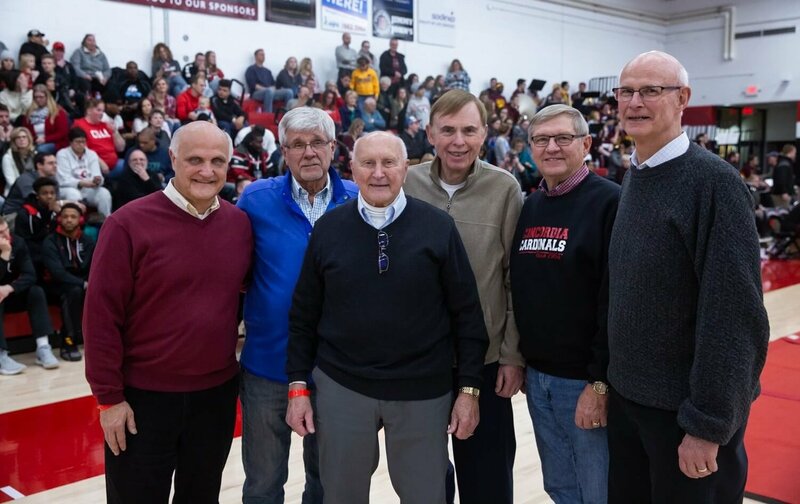 Dave Wenzel, Concordia University Ann Arbor’s first-ever athletic director and 2016 hall of fame inductee, was surprised with a unique legacy gift by his former players during the CUAA women’s first-round game at the 68th annual Concordia Invitational Tournament. Current Athletic Director Lonnie Pries with first-ever Athletic Director Dave Wenzel upon Wenzel’s induction to CUAA’s Hall of Fame in 2016. 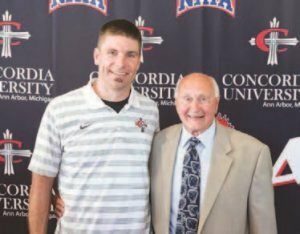 Not only the first-ever athletic director, Wenzel also served as Concordia’s first head baseball coach, first head basketball coach, first intramural director, first physical education instructor, and first head golf coach all between the years of 1963-1968. Tonight, January 25, 2019, was a different kind of first for Coach Wenzel—it was the first he learned about the Coach Wenzel Scholarship, an endowment created in his name by dozens of his former players. 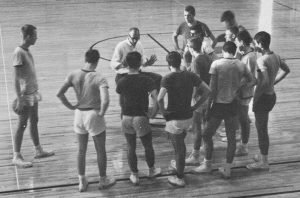 Wenzel coaching the varsity basketball team, 1966. The Coach Wenzel Scholarship will be awarded annually to a student-athlete chosen by current Athletic Director Lonnie Pries, allowing Coach Wenzel’s legacy to continue to live on through these, students year after year. About 50 of Wenzel’s former players have already contributed to the fund. If you would like to make a gift to the Coach Wenzel Scholarship, contact CUAA Director of Donor Relations John Richert at John.Richert@cuaa.edu or (734) 995-7374. Read more about Dave Wenzel’s history at Concordia in his fall 2016 Arbor Light feature, Players First.